Grid Connected Systems are primarily used as a long term investment to reduce the cost of the energy purchased from the Grid and to help in reducing harmful emissions from fossil fuel power plants. Solar Power systems will primarily reduce the amount of natural gas that is being burned during the day for electricity generation. This discussion will attempt to look at grid connected systems in a comprehensive way and provide a lot of information on the operation of the grid and the impact of grid connected systems on the grid. Grid dependent systems are frequently mounted flush on the roof, though larger systems will end up on the ground. A typical 5 KW system would require a roof area of about 34 feet by about 11 feet. The Alberta Micro-Gen regulation allows for the generation of some or all of the electricity that is used on a site. It is not intended for “selling” back to the grid, even though at this point in time, if there is extra energy produced during the course of a year, the account will need to be settled and may result in a cheque going to the producer. If a system is sized to provide more power than what the actual or projected usage will be, then it may not qualify under the micro-gen regulation. Why install a Grid connected Solar System? This is where the marketing departments usually put the nice scenic pictures of the child in a field with the sun in the background, hands in the air, maybe a pet beside and just enjoying the pristine outdoors. While this is all really good, we are going to look at the real reason that most people look to solar power based on experience and what we see in other jurisdictions that have solar incentives. Unless someone else is paying for it, or there is a profit to be made, very few people install solar systems with their own money strictly for environmental reasons. The question is virtually always “What is the Payback”? If people were really concerned about the environment, they would install solar systems without incentives or wanting someone else pay for them. So, does a grid connected solar system save you money? The short answer is that in the long term there will be a “payback”. The time of this payback will depend on a number of factors, not the least of which is going to be the rate at which the cost of electricity is going to rise as the Grid is modernized and coal fired plants are taken off line. Without incentives, payback is likely in the 11 to 20 year range. With incentives or the price of electricity going up significantly, the payback period should shorten. One issue though is that the Canadian Electrical Code keeps increasing the requirements for solar systems, which will make the installations more expensive. You will see many different calculations or opinions on the payback time depending on the variables that are considered and the numbers that are assigned to the variables. Since no one really knows what the actual numbers will be, there cannot really be a definite answer to this question, there are just too many unknowns. Let’s start with looking at the Alberta Micro-Generation definition and purpose of a small Micro-Gen producer. Secondly, the cost for interconnected solar systems is to be recovered from the other ratepayers. (Please read the actual document for the full text). What this means is that the more systems that are connected to the electrical grid, the higher the electricity rates will rise. (Remember that Government and business never actually pay for anything). The costs are always passed down and paid for by either higher taxes or the price of goods and services rising, plus the administrative costs for the people involved in the process). So, the people that will benefit are those who install a solar system and the people that pay are those who do not; therefore, installing a Grid connected solar system will provide a financial “payback” and is therefore a good investment. The time period for this will depend on a number of factors. Below is a chart based on April 2016 rates. 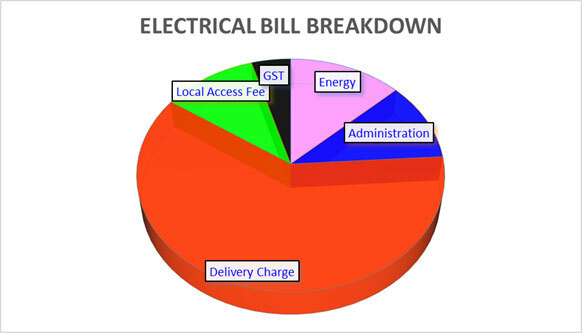 The rest of the charges on the electricity bill are not factored in here since they are generally fixed administration charges and are not affected by the amount of energy that is used. As we can see here, the “Payback” will need to come from the rate of rise in electricity prices, so enter your best guess. With a grid tied system, incoming energy has both the energy and the transmission charge, whereas generally, the outgoing energy (when there is excess energy), only offsets the energy charge. This pushes the “payback” farther out yet. 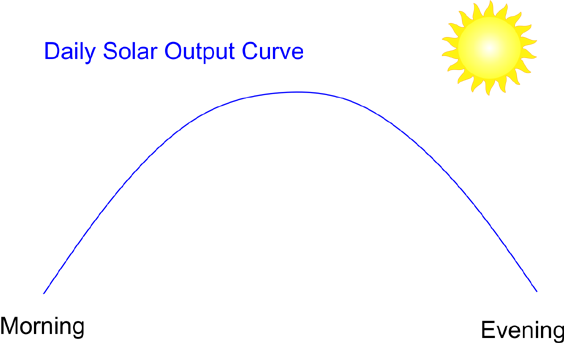 This Chart shows the approximate split for the installation of a Solar system. As we can see here, with the price of solar modules so low now, the “technology” aspect is a fraction of the total cost and further reductions in the “technology” aspect are not going to significantly impact the installed price of Solar systems. It is much more likely that increasing labour, safety and code costs will push the price up. So, let’s take a look at a real power bill here from someone in Didsbury. The rates and charges vary between municipalities, power companies and dates. As we look at this then, the actual energy charge is quite low, less than 2 ½ cents per KWH. The majority of the cost is delivery. 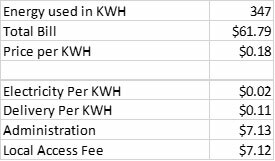 In this example then, when the solar is offsetting the incoming electricity, we get the best “payback” rate, which is the sum of the energy and delivery charges and municipal franchise fee. This comes out to about 16 cents per KWH. The problem is that when extra energy is generated such as during the day in the summer, the outgoing energy into the grid is only valued at the retail rate of 2 ½ cents per KWH. 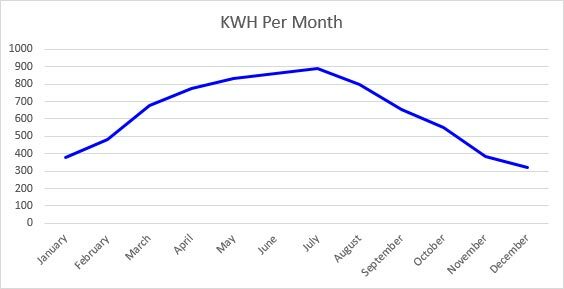 When it is brought back in at night and during the winter months, the incoming rate is back to 16 cents per KWH. What this then means is that even if you have a net Zero home, you will still be paying for the incoming delivery charges at night and whenever the consumption in the home exceeds the production. The local access fee is essentially a municipal tax that is collected by the power company. It is set by the municipality and in Didsbury amounts to 17 % of the distribution charge, so by using the solar power as it is being generated, this charge can also be reduced. 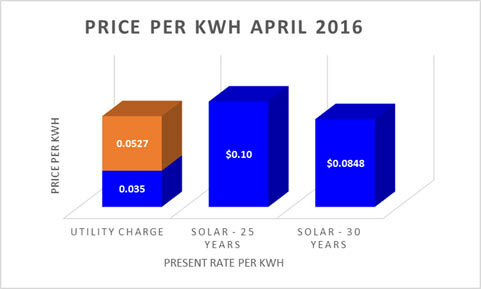 The installed cost of a urban roof installed system spread out over a 30 year period comes in about 8 ½ cents per KWH. The regulated retail rate is about 2 ½ cents per KWH and the wholesale rate about 1 ½ to 2 cents per KWH. The payback period now will depend on several factors. What percentage of power is used as it is produced and how much is used when the solar is not producing. How much and how fast is the price of electricity going to rise. Will there be a change in the way electricity is charged? In other words, will there be a move to just charge a “per KWH” rate and divide the charge out behind the scenes? What incentives will the Government offer and how will it be paid for? Will it be the rate payers, tax-payers, consumers or a combination thereof? We can see then that there is not a simple easy answer as to a “payback” time that can be calculated. There are just too many variables to really predict a reasonable time period, but unless the incentives are really high or the price of electricity rises a lot, the “payback” time will be long. When consumers produce their own electricity, they are still dependent on the electrical grid. So if solar generating consumers can reduce portions of their bill, other rate payers, tax-payers or consumers will need to foot the bill since most of the costs are related to the power distribution system, not the energy production. With a move to shifting more energy to electricity, such as electric vehicles and heating, the grid will need to be “modernized” as the existing local distribution cannot handle the extra load if there is a large percentage of people that implement this change. This will then require higher distribution and delivery charges. Traditionally, many residential Grid connected systems have been installed flush to the roof as the above picture demonstrates. Over time, with experience, changing codes and fire safety concerns, it is time to take another look at this mounting method. Many roofs are not really solar friendly. Trees shade the roofs and roof design does not facilitate the installation of Solar Arrays. Arrays used to be smaller and were typically anchored into the roof trusses by drilling a small pilot hole where the truss was supposed to be and then lag into it. Natural Resources Canada has a Solar Ready document for roof mounted systems available on their website. Please review these 2 documents. It will be up to the municipality and the AHJ (Authority Having Jurisdiction) to determine what mounting method will be acceptable. Workplace codes require safety procedures to be followed when “working at heights” and “working in confined spaces” (attics). Attics, especially residential attics, can present real challenges in adding blocking for the installation of roof mounted solar systems. The roofing material is another consideration. Typical shingle roofs will likely need re-roofing at least once in the lifetime of the Solar system, and unless the shingles are high quality and at the beginning of their lifespan, the roof should be re-shingled prior to the installation of the solar array. To determine payback then, if the roof will need to be resurfaced over the life of the system, you will need to add the cost of removing the system and re-installing it. The next item relates to the fire fighters. Again, different municipalities have different requirements. In some locations, fire fighters do not go on the roof anymore because of the dangers involved. Other jurisdictions may require a 1 meter or about 3 foot clear area on the sides and top around the solar array for access. As codes and technology change, we are seeing more and more electronics on the roof. This is in the form of Micro-inverters, Power Optimizers, Rapid Shut Down devices and “smart” combiner boxes. While these may enhance the production of the solar system and safety of the fire fighters, servicing them now increases the risk that electricians and service technicians face. Working safely is expensive and during certain times of the year or with bad weather conditions is not really feasible. Roof mounted system can be snowed under for days, weeks and even months in certain areas of the Province. Basically, flush mounted systems that are more towards the West and North will experience more snow cover and for longer times, elevated systems and systems to the South and East will generally have less time that they are covered and clear faster. This would reduce the yearly production and push the payback time back some more. A new Canadian Electrical Code requirement for “rodent protection” for the conductors can now cause some other issues as the “fence” around the array can now cause leaf and debris build up as well as snow, ice and water dams. This could lead to leakage of water into the attic. For elevated arrays such as those on flat roofs, this requirement is just about impossible to meet with the current products that we have. Module dimensions change over time. An exact replacement for a rare defective module may be difficult to find years down the road. Larger arrays will also make it difficult to service modules or electronics behind the modules. Ground mounted arrays are typically more expensive and generally not feasible in urban residential areas, and are therefore more suited for rural areas. Ground mounted arrays will push the “payback” time back quite a bit, since a good ground mounted system will add about 65% to 70% to the cost of the system if it is done right. Ground mounted systems will generally produce a little more electricity over the course of the year, since they are generally tilted at the best angle for optimum production. Between the higher angle and less time being covered in snow, the gain for a ground mounted system over a flush mounted system could be anywhere from about 7% to about 14%. At this point in time, ground mounted arrays would not need the electronics that roof mounted systems require for code purposes. This would help in making a ground mounted system more reliable in the long term and have lower servicing costs over the life of the system. Ground mounted systems would also not have any re-roofing costs associated with them. How the Grid works and the costs associated with Grid connected solar systems. This portion of the discussion will present a description of the electrical grid, how it operates and what the impact of grid connected solar is. 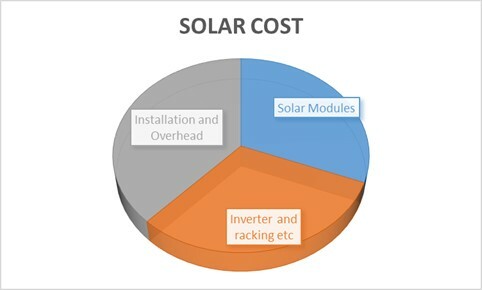 This is important to understand when looking at grid connected solar generation in terms of system “modernization” as well as understanding the cost implications of adding solar generation to the conventional generation. It will also help to understand the various charges on the electrical bills and how the addition of renewable energy will impact the cost of electricity. The electrical grid was originally designed to produce the lowest cost of electricity to the consumer. Coal plants and Hydro-electric plants tended to be the most cost effective way of generating power. Natural Gas Generation Plants and Hydro Electric Power Plants work quite well with renewables since they can respond quicker to changes in demand. (Coal and Nuclear generally do not). Larger plants feeding into the main distribution lines with branch circuits provided the most cost effective way of doing this. In Alberta, the generation and distribution system has been divided up. There are the Generation plants, high voltage transmission lines, lower voltage transmission lines and the energy retailers. Generally, each of these parts of the Grid is a different business, and as such, the charges for each of these parts is shown and billed separately on the consumer’s power bill. Additionally, municipalities may require a “franchise fee” to be paid by the utility company. This is essentially a tax by the municipality that is collected by the power company. The following diagram shows pictorially in a simplified way, the complete power grid from generation to the consumer. As you get farther away from the substation, autotransformers boost the voltage to compensate for the voltage drop on the lines. The transformer on the pole or sitting on the ground then steps the higher voltage down to the voltage that we use in our homes. 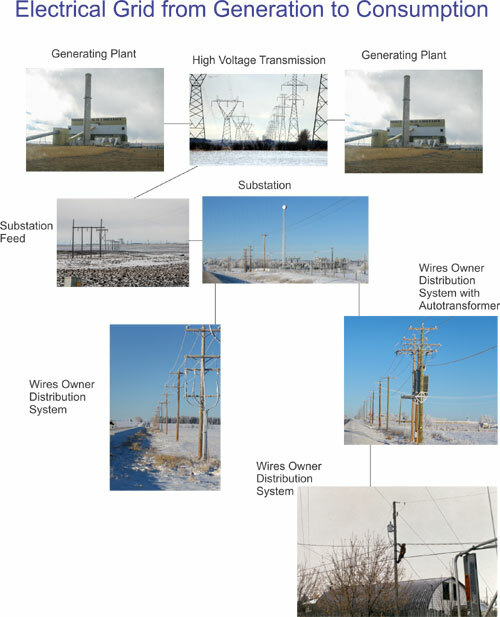 The sizing of these transformers and associated wiring is based on demand factors that the utility companies have found to work well, while providing the most cost effective way of providing a reliable network. The electrical panels in our homes are sized similarly. If you were to add up all the branch circuit breakers, you would come up with a much higher number than the main breaker. Typically, the KVA demand for an urban residence in Alberta has been in the 5 to 7.5 KVA range. This means that typically we would see a 50 KVA transformer supplying about 6 to 10 homes. According to the Canadian Electrical Code, if we have a normal 100 amp service, after you do the calculations, you are pretty much limited to about a 5 KW system which works out pretty good with the demand that has been used by the power company. When we start interconnecting renewable energy systems into the grid, there are several things that need to be looked at. The electricity and distribution costs were calculated to reflect the cost of providing these services. When renewable energy is fed into the system now, it skews the business model. The grid is now used by the consumer that is producing energy and feeding into the grid. This reduces the income for the power companies. This reduction in income must now be passed on to other consumers that are not feeding into the grid. When the renewable energy penetration is low, the main grid is not affected very much and the cost associated with connecting renewable sources of power results in fairly minor increases in the total energy costs. With a higher penetration, the result is that the power plants will now have a reduced output while the renewable generation is feeding in. This means that the power plant will be producing less revenue for the investment in building it. Electricity rates will need to be raised to account for this. While a low penetration of Solar will generally not have much impact on the operation of the grid, a larger penetration or a large project at the far end of a branch will. Grid interactive inverters work by trying to raise the voltage in order to feed the current into the grid. When you start doing this at the far end of a branch, the effect will be that the voltage can rise significantly, therefore creating an overvoltage situation. Grid inverters usually shut down around 264 Volts (this would be 132 volts from phase to neutral instead of 120 Volts). Related to this is the voltage drop from the transformer to the residence or farm. In a normal distribution system, the distance from the transformer to the point of usage can be several hundred feet. To compensate for the voltage drop over the wires, the transformer voltage is typically set a bit higher. Commonly, I have seen this voltage at about 123/246 volts on a farm, and it works out pretty good. When we feed in to this line though, we start raising the voltage. So for example then …. At night then, the voltage at the house is at 120/240 after the voltage drop on the lines. When we get to the middle of the day and are feeding in lots of power, we remove the voltage drop from the transformer and, if we are producing more than what is being used in the house (i.e. feeding into the grid) we now have the voltage at the house rising higher than even the base 123/246 that the transformer was set at. We could then see 125/250 or even higher depending on the length and size of cable and the amount of current being fed back into the grid. The best location of the point of interconnection is as close to the transformer as possible. For farms or acreages that are served by a single transformer, the limiting size of the solar system will be the transformer and the protection installed by the utility company. Larger transformers and protection can be installed and are usually subject to the associated costs. Grid interactive inverters have to shut down pretty much immediately upon a power failure. One of the undesirable effects of this is that if there are momentary power bumps or outages, the grid inverter will shut down and not reconnect until the grid is stable for 5 minutes. Again, with a small amount of solar connected, there will not be much impact, but when you have high concentrations of solar, this could then leave the conventional plants having to pick up the slack in a very short time period. This has the potential for some large scale domino type of grid failures. This is an issue that has been identified in areas that have large penetrations and work is being done on finding ways to deal with it. Another item to look at is the time of day production and the monthly production related to grid capacity. The following 2 charts show the average monthly and daily production of a 5 KW flush mounted solar system without accounting for any snow cover in the Calgary region. This array would theoretically generate about 7600 KWH per year, or an average of about 20.8 KWH per day. This is about the average for a Calgary Home. 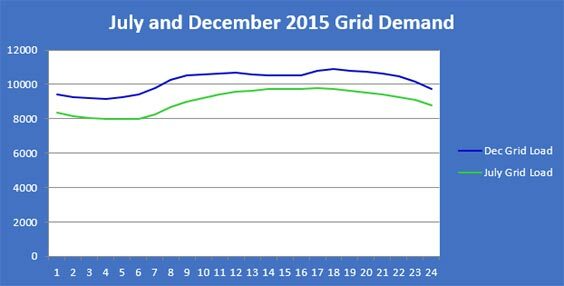 The third chart shows the grid demand on an hourly basis for December and July. To sum up then, we can see that the solar generation is essentially compacted into 1/3 of the day in the warmer months of the year when the Grid Demand is lower than in the winter. The following chart shows what we would expect to see if there were about 2500 Megawatts of interconnected solar on a bright summer day. The dark blue is the baseload and peaking generation and the yellow is the solar. So, the peaking generators start to pick up the load, then cut back as the solar comes on line. As the sun starts to go down, the peaking generators again pick up the load. As we can see here, the peaking generators need to be able to respond fairly quickly, and the conventional generation capacity cannot be decreased, so the solar generation is effectively a duplication of infrastructure and primarily serves to reduce the pollution that is emitted by the peaking generation (which is primarily natural gas). Since grid connected solar has a relatively low output in the winter when the demand is the highest and a high output during the summer for a short time of the day, it really does not help the grid at all in terms of infrastructure or transmission capacity. The effect of winter production is not shown on this chart, but it will have significantly less impact than the summer production that is shown. One important aspect to note is that the Grid cannot store energy. Electricity must be produced basically the same second as it is being used. Work is being done on Grid based storage systems, but these systems are fairly short term storage units and generally speaking are more designed for minutes or hours than days, weeks or months. For Solar and Wind to really be effective in reducing pollution and conventional generation capacity and for the grid to operate with stability, it really needs to be combined with energy storage units and generation that all work together, ideally in one location. The way it is right now, gas generators essentially need to be running in the background to pick up the load as solar and big wind generation changes. This causes emissions and increases electricity costs. Chart information is based on AESO Data. 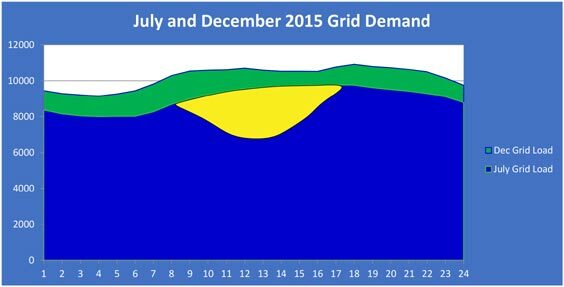 Yellow is an approximation of the impact of solar on the Grid based on this demand. The Electrical Business Magazine had an Article analyzing Ontario’s attempt at Greening the Grid. It is a worthwhile read and really puts things in perspective. While these and other issues are not insurmountable as the grid is “modernized”, it will require time and resources to address, which of course, will again increase the cost of electricity. There are some incentives available. The Alberta Government lists these on their Website. 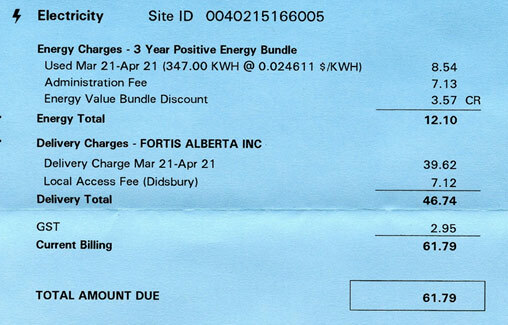 The Alberta Solar Society also lists a number of these on their website at Grants and Incentives. In other words, telling it like it is. As you will likely have gathered by now in going through my website, I know that Solar works, I like Solar power, I have spent a lot of my own money on Solar (and on wind as well). I have lived totally on Solar power (and some wind for a few years) for over 15 years now without having the grid or a generator as a crutch. I have been an electrician for over 38 years now with lots of experience in various aspects of the trade. I would like to present some information here so that you, the reader can come to your own conclusions based on actual facts regarding Grid connected Solar Power. You can also read an article that I wrote for the Electrical Business Magazine titled Taking the Grid “Off Grid” and one that was written by Ron Bergeron regarding Ontario titled Less Greening and more Meaning. So, just doing simple calculations without going into financing costs, rising electricity costs and the like we come up with the following. 1 Watt of installed Solar module will yield approximately 1.28 KWH per Year in South Central Alberta. This gives us a lifetime cost of about 4 cents per KWH compared to the current 1.7 cents per KWH with conventional utility generation. For reference, the average Calgary home consumption is about 21 KWH per day. So, what is not included in this cost? We have stretches of several days of heavy overcast during the times of highest demand. The wind does not always blow when it is needed. The Yellow represents Solar Production in December in comparison to the actual demand for Alberta. This would be on a bright sunny day with a 4 MW system. Here the yellow represents the Solar production in July on a bright sunny day for a 4 MW system. Here we have a chart from the Alberta Electric System Operator that shows actual wind output and forecast models for December of 2015. Note here that there were about 5 consecutive days of very low output. So what are the ramifications of these illustrations? Either storage, generation or a combination of both are required to provide reliable power. In the current discussions of the cost of producing electricity from renewable resources, I rarely if ever see this discussion taking place. Having these standby resources there and not producing power all the time will mean that there will need to be compensation for the availability of these assets as they will not be operating at their full potential, thus increasing the cost per KWH to operate. There is an increased awareness of the need to incorporate storage with the increasingly higher penetrations of intermitted renewable energy sources. These are generally targeting seconds, minutes or even hours, but not enough to provide the amount of storage to be able to run totally on renewable energy sources such as wind and solar as I am doing. Cost always seems to be the major factor. People want to help the environment and do their part, but the concern is always on how it will impact them financially. The Government should offer incentives right? Well, where does the Government get its money from? Tax payers and business. Where does business get its money from to pay? Well, from you and I through the price of its products and services. Just raise the price of electricity? If the cost of producing and incorporating electricity from renewable sources was indeed profitable, then incentives and regulations would not be needed to encourage the adoption of these energy sources. So, no matter how you look at it, consumers and taxpayers will pay for “modernizing” the grid, and it is just a matter of who will pay and what price we are willing to pay for having a cleaner environment. With all the focus by the Alberta and Federal Governments on renewables, there is a flood of companies and people entering the Grid Tied Solar market. There should be lots of suppliers and installers to choose from now. With current economic times, it seems that a lot of these companies are just trying to get their foot in the door and installing at rates that are too low to be viable or feasible from a business perspective, so expect a revolving door as they enter and leave the Solar field. While this may appear to be good news for the consumer, along with the program that has been announced by the Alberta Government, I will not be participating in the race to the bottom, as I intend to stay in business to serve my customers. The Alberta Solar Society has a list of installers on their website at Solar Providers. There are 2 main issues with the mounting of the arrays that will need to be discussed with the Inspectors prior to going forward. It would also be a good idea to discuss the rest of the new Electrical Code requirements prior to proceeding.